Fall is the perfect season for the eco-conscious homeowner to improve their lawn. The warm days and cool nights of autumn provide ideal conditions for providing some R&R for your yard. If you’re looking to be more environmentally friendly, following these five eco-friendly lawn care tips each fall will help improve the overall quality of your turf and soil in an all-natural way! Mow. Don’t stop mowing your lawn just because its growth has slowed! Try to keep your grass height at two to three inches tall. Grass that’s too short may be vulnerable to the cold Maine winter and could sustain damage; grass that is too tall will matte under the weight of the snow making it susceptible to snow mold or fungus. Rake. It may feel impossible at times to keep up with the falling leaves, but your lawn will thank you. Leaving leaves on your turf in fall and through the winter will cause bald spots as your grass is killed off. The leaf litter blocks light and traps moisture that results in soggy, decaying patches all over your yard. Raking and mowing are a powerful duo – if your lawn mower has a mulch setting, you can combine these tasks. Just don’t forget the areas that your mower can’t reach where leaves pile up. extract tiny plugs from your turf allowing water, oxygen, and nutrients to reach the soil and support a healthy ecosystem within it. Be sure to use the right tools, though, aerating that pokes holes in the ground without removing small plugs can worsen compaction issues. Aerating is best done after mowing and followed by overseeding. Your lawn will be feeling the love and showing it come spring – you’ll probably even see fewer weeds! Overseed. The hot summer days are the worst time to plant grass seed. Conversely, autumn’s warm days and cool nights provide the ultimate growing conditions for an effective overseeding treatment. Before overseeding, research the right grass seed for your yard. Apply to thin or bald areas to enhance your lawn and thicken it sustainably. A healthy, dense lawn is strong, self-sufficient and makes it harder for pesky weeds to grow. Fertilize (with organic). Your grass is like an iceberg – the part that you see is just a small part of the whole plant. Don’t forget about the root system of your grass and the ecosystem in which is grows, the soil. Traditional lawn fertilizers are made from synthetic chemicals, and their goal is to turn your grass green, not provide nutrients to the soil to feed the roots. Organic fertilizers will put nutrients and microorganisms back into the soil that help repair summer damage, replenish nutrients, and encourage healthy root growth to survive winter and thrive when spring returns. Avoid lawn care companies that seek to build “value” by fertilizing every month. It’s not required, nor is it healthy for your lawn or the environment. At Lucas, we understand that your home is more than a house and a yard. It’s your sanctuary and pride. The trusted lawn care professionals at Lucas are here to help you achieve a healthy, green lawn that doesn’t harm the environment. Every lawn we meet is as unique as the homeowner, that’s why we offer three responsible Evergreen Lawn Care options that will satisfy your vision and ensure that you only pay for what you and your lawn actually need. We use 100% organic fertilizers and follow responsible application practices. 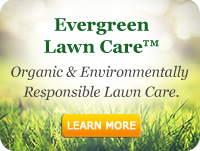 Contact Lucas today to explore our three Evergreen Lawn Care options and find the one that suit your needs.